"The 'Miraculous Draught of Fishes' was begun at the end of 1959 and completed in January 1960. It was one of many paintings which I have been working on for the last two or three years in which the sea has been the major subject. The 'Miracuous Draught' was a theme that I had been concerned with for some time, and one which I hope to develop further. Of two accounts of a great draught of fishes in the New Testament, the dramatic beautry of the one in Luke, with the breaking of the nets and the sinking ships, seemed to have a sort of tension and richness which, to me (at that moment, anyway) had to be expressed in paint, rather than the calmer story as told in John, chapter 25". 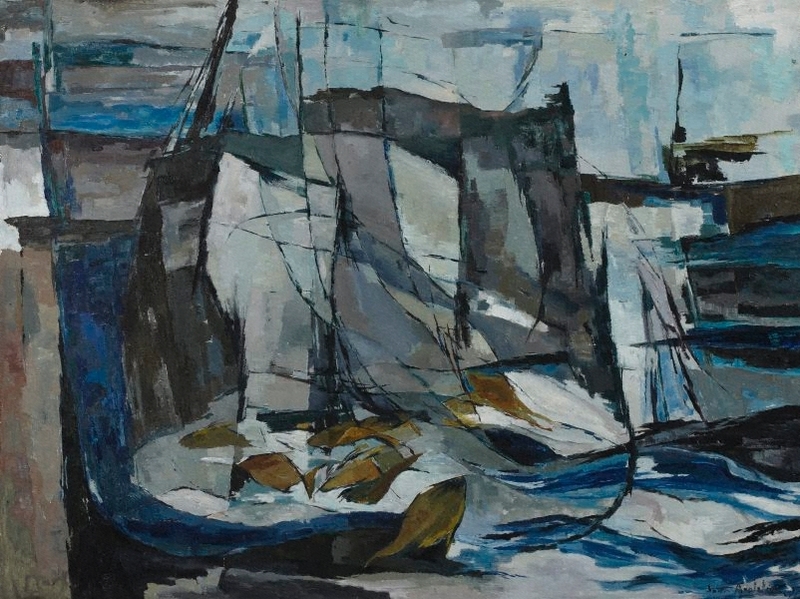 The painting was awarded the Darcy Morris Memorial Prize for a scriptural subject at the 1960 Blake Prize competition, in which this work was entered and subsequently exhibited. Signed l.r. corner, black oil "Jean Appleton". Not dated.